The result is a slightly modern twist on the tabi socks, knitting eliminates the seams on the bottom of the feet and make for a better fit, I added a mock seam down the back of the foot like the ones a sewn pair would have so you can add a row of buttons for that extra cuteness factor. The heels and toes are done in contrasting colour so the eyes are drawn to the unusual toes. 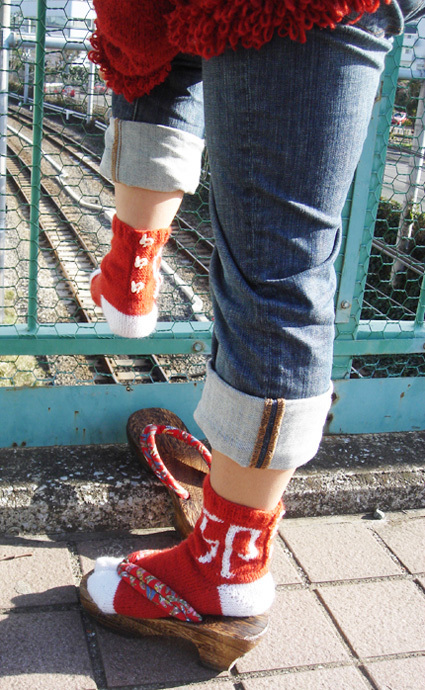 I also added an intarsia design on the ankles for a bit of spice. These socks are done toe up so the tricky part is out of the way early and you are left with only the fun bits. Enjoy! These socks are knit from the toe up, beginning with the larger toe cap (holds all toes except big toe). Using CC and Crochet Cast On method, CO 11 sts. Work 4 rows back and forth in stockinette st, beginning with a k row. Round 1: K all sts on needle, pick up and k 2 sts along edge of work; remove waste yarn from CO and place live sts on a spare needle, k these sts using a second needle, then pick up and k 2 sts along remaining edge of work. 26 sts. Place safety pin or split ring marker in work to indicate beginning of round; move this marker up as work progresses. Next Round: Kfb, k to last st of Needle 1, kfb; kfb, k to end of Needle 2; k to last st of Needle 3, kfb. 4 sts increased. Repeat these 2 rounds once more. 34 sts. Next Round: Kfb, k to end of Needle 1; k all sts on Needle 2; k to last st of Needle 3, kfb. 2 sts increased. Repeat these 2 rounds 4 times more. 44 sts. K 1 round. Try on toe cap to check length; if it does not reach to base of toes (especially base of second toe, next to big toe), continue in stockinette st until it is long enough. Slip first 18 sts of round to one stitch holder, slip next 8 sts to waste yarn, slip remaining 18 sts to second stitch holder. Remove marker and break yarn. Using CC and Crochet Cast On method, CO 5 sts. Round 1: K all sts on needle, pick up and k 2 sts along edge of work; remove waste yarn from CO and place live sts on a spare needle, k these sts using a second needle, then pick up and k 2 sts along remaining edge of work. 14 sts. Repeat these 2 rounds once more. 22 sts. Repeat these 2 rounds twice more. 28 sts. K 5 rounds. Try toe cap on to check length; if it does not reach to base of toe, continue in stockinette st until it is long enough. Remove 8 sts of first toe cap from waste yarn and place on spare needle. Joining Round 1: K first 10 sts of round, join next 8 sts of round to 8 sts from first toe cap (sts on spare needle) using Three Needle Bind Off, work remaining 10 sts of Big Toe Cap. Note: When working the second joining round below, the needles will be designated and arranged differently for the right foot and left foot. Joining Round 2: K first 10 sts of Big Toe Cap, pick up and k 2 sts along edge of join, k 18 sts from one stitch holder, this needle will be designated Needle 2; using another needle, k first 15 sts from second stitch holder, this needle will be designated Needle 3; using another needle k remaining 3 sts from stitch holder, pick up and k 2 sts along edge of join, k remaining 10 sts of Big Toe cap, this needle will be designated Needle 1. 60 sts. Proceed to directions for Foot. Joining Round 2: K first 10 sts of Big Toe Cap, pick up and k 2 sts along edge of join, k first 3 sts from one stitch holder, this needle will be designated Needle 3; k remaining 15 sts from stitch holder, this needle will be designated Needle 1; k 18 sts from second stitch holder, pick up and k 2 sts in edge of join, k remaining 10 sts from Big Toe Cap, this needle will be designated Needle 2. 60 sts. Proceed to directions for Foot. Note: Both feet are worked in the same way from this point, until the intarsia section begins. K 5 more rounds, ending last round at point between Needle 1 and Needle 3. Break CC, and move stitch marker to point between Needle 1 and Needle 3; this will now be beginning of round. Using MC, work in stockinette st until work measures 2 inches less than desired length to back of heel. Note: Heel is worked using CC. Do not break MC; just set ball of MC to the side while working heel. Next Round: Using MC, k to end of Needle 2; using CC, k all sts of Needle 3 and Needle 1 onto one needle. Heel will be worked back and forth on the stitches on this needle only. 30 sts on needle. Turn work so WS of work on second needle (needle with sts from Needle 1 and Needle 3) is facing. P to last st on needle, w&t. K to last st on needle, w&t. P to last 2 sts on needle, w&t. K to last 2 sts on needle, w&t. P to last 3 sts on needle, w&t. K to last 3 sts on needle, w&t. P to last 4 sts on needle, w&t. K to last 4 sts on needle, w&t. P to last 5 sts on needle, w&t. K to last 5 sts on needle, w&t. P to last 6 sts on needle, w&t. K to last 6 sts on needle, w&t. P to last 7 sts on needle, w&t. K to last 7 sts on needle, w&t. P to last 8 sts on needle, w&t. K to last 8 sts on needle, w&t. Note: While working the rows which follow, when you come to a wrapped st, pick up the wrap, and knit (or purl) it together with the stitch it had wrapped. When turning the short rows that follow, you will be wrapping stitches which have already been wrapped once. P to last st on needle, w&t. P all sts. Break CC, turn work. 15 sts each on Needle 1 and Needle 3. Right Foot: 16 sts on Needle 1, 17 sts on Needle 3. Left Foot: 17 sts on Needle 1, 16 sts on Needle 3. Replace marker between these two needles to indicate beginning of round. MC is currently attached to end of Needle 2; using MC, pick up and k 2 sts in space between Needle 2 and Needle 3, k all sts on Needle 3; k all sts on Needle 1, pick up and k 2 sts in space between Needle 1 and Needle 2, k to end of round. 64 sts. Next Round: K to last 2 sts on Needle 1, k2tog; k all sts on Needle 2; ssk, k to end of Needle 3. 2 sts decreased. Repeat these 2 rounds once more. 60 sts. Note: If you want your sock to be longer than the one shown, work a few more rounds at this point. 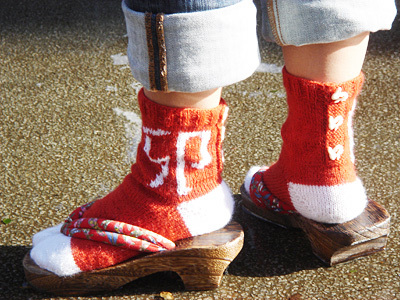 The good thing about knitting toe up is that you can try your work on as you go, to check the fit. On next round, intarsia motif is begun, and work is divided to form back placket opening. Because of intarsia motif placement, next round is worked differently for right foot and left foot. Right half of placket overlaps left half for both feet. Please read ahead before beginning. Next Round: K all sts on Needle 1, k first 18 sts on Needle 2, work first row of chosen intarsia motif over next 21 sts, k to end of Needle 3; pick up and k 1 st in front of stitch each of next 3 sts on Needle 1. Turn work to that WS is facing. Next Round: K first 6 sts of Needle 1, work first row of chosen intarsia motif over next 21 sts, k to end of Needle 3; pick up and k 1 st in front of stitch each of next 3 sts on Needle 1. 63 sts. Turn work to that WS is facing. Next Round: K6, p to last 3 sts, working intarsia pattern as set; k 3, pick up and k 3 sts in purl bumps of sts below next 3 sts on Needle 3. 66 sts. Turn work. Leg will now be worked back and forth in rows. Garter stitch bands will be worked at ends of each row, forming an overlapping placket. Next Row [RS]: K all sts, working intarsia pattern as set. 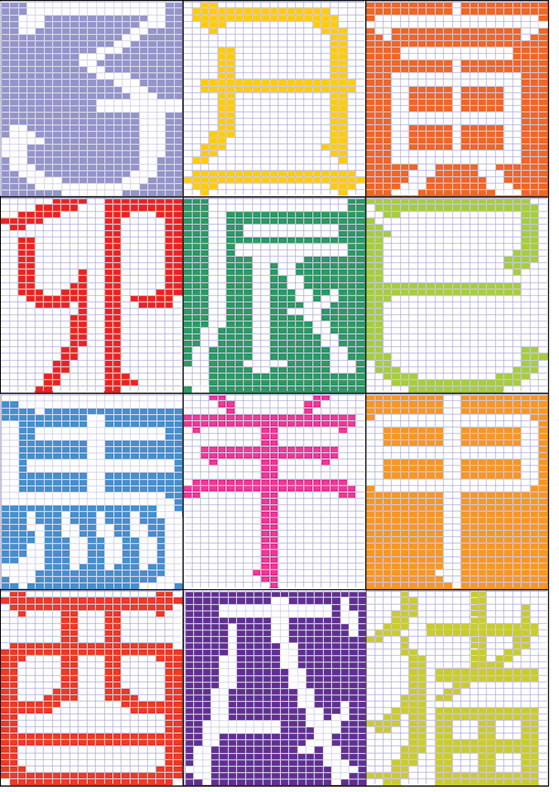 Next Row [WS]: K6, p to last 6 sts, k6, working intarsia pattern as set. Continue in pattern as set until all rows of intarsia pattern have been worked. Break CC. Work 6 more rows in pattern as set. Next Row [RS]: K2, [p2, k2] to last 4 sts, p2, k2. Next Row [WS]: P2, [k2, p2] to last 4 sts, k2, p2. BO all sts loosely in pattern. Sew back seam closed along edge of inner layer of placket. Sew on buttons, sewing through both thicknesses of fabric. Weave in ends and get out your getas! Pinn should really be preparing for her lessons. Why? Because she will be attending a real knitting course for the first time very soon! She's very excited but also nervous that her poor Japanese will let her down in front of the entire class. When she's not crafting, Pinn is working in her garden, her motto is: if it's not food, it's not good. She spends her mornings planting, pruning and hoping that her black thumb from hell will finally turn green this year. She's thinking about knitting a net for her string beans but she's not sure they will appreciate it. Visit her at her site.